Cyrus Avery and his visionary team so successfully marketed U.S. 66 as the Main Street of America that ninety years later it is, perhaps, the most famous highway in America. It is also a living time capsule where the Main Street of America forever immortalized by reruns of I Love Lucy, Norman Rockwell, Andy Taylor and Barney Fife, and George Bailey lives on forever. While America slowly awakens and discovers that there is a portal stretching through the heartland where the past and present, and even the future blend together seamlessly, an ever growing legion of international enthusiasts are turning this old highway into America’s longest attraction. That, my friends, adds an infectious vibrancy and excitement to almost any Route 66 adventure or event. On Tuesday night I was quite privileged to assist with the organization of a very special reception ceremony for Dries Bessels of the Dutch Route 66 Association (his charming wife Marion was unable to accompany him on this years Route 66 tour), and a U.S. Bikers Route 66 tour consisting of travelers from the Netherlands, Belgium, and England. It was, to say the very least, a fun filled evening that exemplifies the latest incarnation of this storied old highway. In 2014, during the Route 66 International Festival, a walk of fame was unveiled on Andy Devine Avenue to honor as well as commemorate the individuals that have played a role in transforming Route 66 from a highway into an icon. Each year during the Best of the West on 66 Festival, new inductees will be added. This year that included Dries and Marion Bessels. In addition to playing a key role in the establishment of the Dutch Route 66 Association, Dries and Marion make an array of tremendous contributions to the international Route 66 community from tree planting in Galena, Kansas and speaking at the Crossroads of the Past and Future conference during last years international festival, to playing a role in the development of the 2016 Route 66 European Festival, the establishment of an informative website for Dutch enthusiasts, hosting receptions for American Route 66 enthusiasts in Amsterdam, and providing assistance to travelers during their treks along Route 66. As Dries and Marion will be unable to attend the official ceremony during the festival, a special reception was hosted by Ramada Kingman. Dora Manley and City Manager John Dougherty made the presentation as the cameras flashed, and a dinner followed. 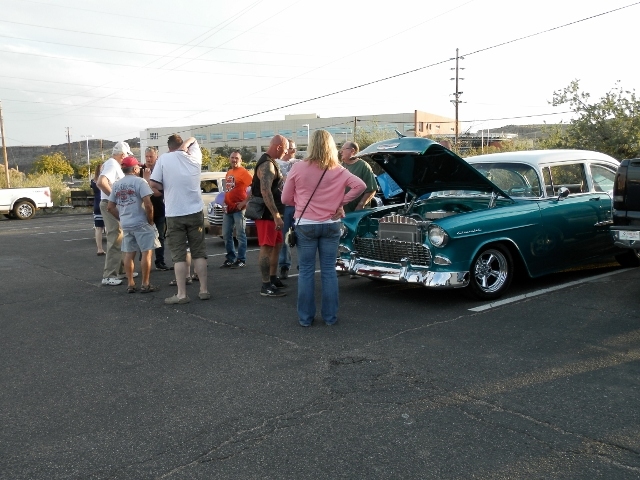 In a wonderful display of community support, local car club members pressed their vehicles into service to provide the group with memory making transportation. Vintage military trucks, classic Chevy’s, convertibles, and roadsters made for a quite a parade through town. Barriers of language and culture seem to melt away on Route 66. That was surely the case on Tuesday night. This link is for the feature about the reception published in the Kingman Daily Miner. Next, a reception for our friends from the Czech Republic, Eva and Zdnek Jurasek. Between now and their visit, we have Chillin’ on Beale with Cinema under the Stars, the County Fair, and Best of the West on 66. Then my dearest friend and I can turn our attentions to a road trip and the festivities in Edwardsville. TRAVELING WEST ON ROUTE 66, WHAT COMMUNITY COMES AFTER WINONA, AT LEAST ACCORDING TO BOBBY TROUP?